I've had an interesting relationship with the Uke, it was, in fact, the first type of string instrument I played as a very small child but I don't think I actually 'played' it, just strummed it randomly without any attempt at making it musical... It wasn't until early 2013 that I decided to get one and have a proper go at it. So as I learn more songs, techniques and tips, I'll pass them on to you here. There is a lot of skills that transfer easily from the guitar so if you've been plucking the six-string for a while, you'll probably find the transition pretty easy! It really is a great fun little instrument, and very friendly... nice soft nylon strings, easy to carry around and it's not like anyone ever expects you to do anything fancy or complicated... so there's no pressure if you pull one out at a party! Hope you enjoy it as much as I do. 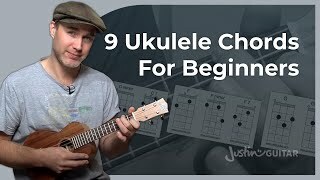 I think learning songs is the most fun way of learning new chords and techniques, so do check out the ukulele songs on the songs area of the site (you can use the filter so you only see the ukulele songs!) or you could use this super cool app called Ukeoke which is a bunch of cool play along songs and lesson (by me!) and it's available for iOS and Android! 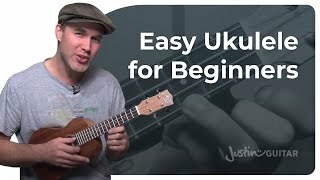 This is the quick and easy guide to playing the Ukulele! Learn 4 easy chords, simple strumming and a whole bunch of awesome songs. You'll be playing in no time! 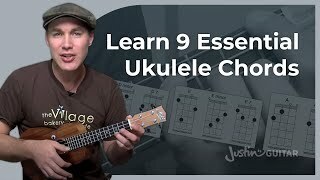 Learn more Ukulele Open Chords in this lesson in which we'll learn another 9 common uke chords, major, minor and 7th for D, E and A. 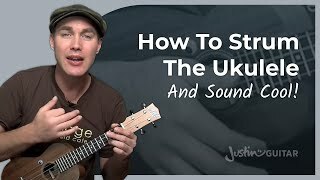 In this lesson we'll learn the Shuffle Strum which is a real common groove for the ukulele, a very happy feel! 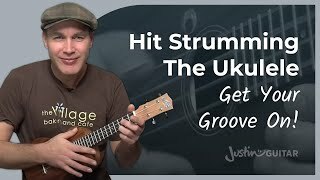 In this ukulele lesson, we'll play the backbeat groove which adds an accent on beats 2 and 4 of your strumming pattern! 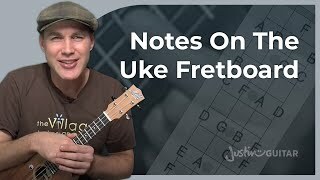 In this ukulele lesson, we'll be learning the notes on the fretboard which is very useful for learning chords, scales and more! 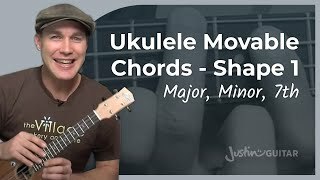 In this ukulele lesson, we learn a movable chord shape (much like a barre chord on guitar) which will expand your chord vocabulary dramatically!